There are plenty of ‘Big Things’ to see in Australia, and they’re not all hidden in pyjamas. 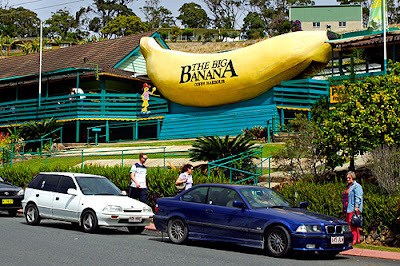 The Big Banana in Coffs Harbour, New South Wales is the first and best known ‘Big Thing’ in Australia. Icon built in 1964: The Big Banana measures 13m long, 5m high and 2.4m wide. At The Big Banana complex, the World Of Bananas Experience is displayed in two specially designed theatres. The attraction incorporates a state-of-the-art presentation detailing the discovery of bananas and advancing through to the present day. Upon completion of the show, patrons are guided through an informative plantation tour and into the Packing Shed to view a short video presentation. There’s a huge gift and souvenir shop, and the Going Bananas Café provides light meals and delicious treats. It’s a whole bunch of fun and located at 351 Pacific Highway, Coffs Harbour. Phone: 02 6652 4355. 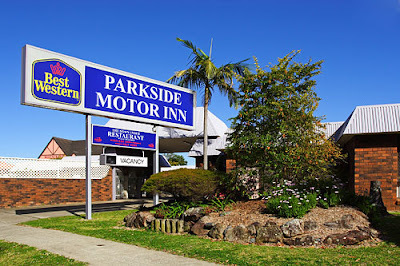 Parkside Motor Inn: Property features include a licensed restaurant and swimming pool.